September 5, 2018, Thekchen Chöling, Dharamsala, HP, India – The second day of this year’s reading of the Buddhapalitavrtti began with Thai monks chanting in Pali a praise of the Ten Perfections according to the Theravada Tradition. These perfections include: generosity, ethics, renunciation, wisdom, energy, patience, truthfulness, determination, loving-kindness and equanimity. Next, nuns and monks led the 350 Koreans in reciting the ‘Heart Sutra’ in Korean to the rhythmic beat of a wooden fish gong, a ‘moktak’, which symbolises alertness. His Holiness the Dalai Lama began by acknowledging the efforts that members of the audience had made to come to attend these teachings. “Today, in the 21st century, we have made good material and technological progress and yet religious traditions that are thousands of years old are still with us. They are helpful to us. Some of them rely on faith because that is what is most beneficial for some people. In India religious traditions have emerged that rely on reason and investigation, which have given rise to various philosophical ideas. Several of them, such as the non-theistic branch of the Samkhyas (the Enumerators), Jains and Buddhists, discuss the Two Truths—conventional and ultimate truth. “Practices for developing a calmly abiding mind and special insight (shamatha and vipashyana) have long been part of the Indian tradition. As we’ve just been reminded in the ‘Heart Sutra’ the Buddha taught about emptiness, but he didn’t mean that things don’t exist in conventional terms. Ignorance involves our misconception of the way persons and phenomena exist. Applying marvellous intelligence and wisdom the Buddha became fully aware of selflessness. “The Buddhist tradition in general and the Nalanda Tradition in particular teach about the way things exist as a ground reality starting with causality. They go on to examine how things appear to exist and how that appearance does not accord with reality. This is a reasoned approach, therefore the more you examine reality the stronger your understanding will be. “In Asia many countries are Buddhist by tradition, but these days we find people from other lands also taking an interest in what the Buddha taught. Scientists are intrigued by the explanation of dependent arising. I’ve asked some of them if there is a corresponding theory in science. I’m told there isn’t, but there is appreciation for the Buddhist point of view. In his ‘Illumination of the Thought’, Je Tsongkhapa describes three levels of dependent arising—that related to causation, to dependence on parts, and to dependence on mere designation. 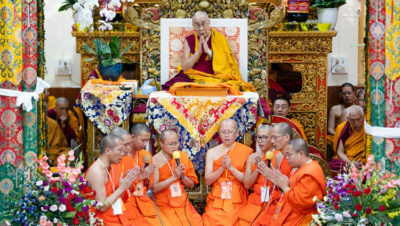 His Holiness observed that Haribadra described two kinds of Buddhists, those who follow faith and those with sharper faculties who follow reason. He remarked that putting together a spiritual practice is like constructing a house—you have to start with a firm foundation. The goal is nirvana defined as true cessation or liberation from mental afflictions, although it can also mean freedom from all obstructions to knowledge. 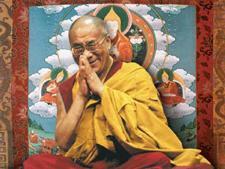 His Holiness then mentioned the need for high status or a good rebirth in order to be able to continue to practise. Nagarjuna’s ‘Precious Garland’ lists sixteen causes of high status. There are thirteen activities to be stopped. Of the ten unwholesome deeds to be avoided, three are physical – killing, stealing and adultery; four are verbal – false, divisive, harsh, and senseless speech; and three are mental – covetousness, harmful intent, and wrong views. Three additional activities to be restrained include drinking liquor, wrong livelihood and doing harm. There are three further activities to be adopted – respectful giving, honouring the honourable, and love. “In cultivating good conduct as the foundation of practice,” His Holiness continued, “you can first become familiar with keeping the 24 hour vow and later take up the precepts of a lay-practitioner for life. The middle volume of Kamalashila’s ‘Stages of Meditation’ explains how to develop concentration. It refers to the shortcomings of laxity and excitement how they arise and how you can overcome them. Through this practice you become familiar with your mind’s dwelling on the object of attention. The result is a powerful mind that can be employed more effectively in analysis, which gives rise to special insight. Answering questions during a short intermission, His Holiness explained that the instructions of the sutra vehicle comprise the general structure of the teachings whereas the practice of tantra consists of specialised instructions for specific disciples. Asked how to practise he repeated what he had said earlier about combining an understanding of emptiness with bodhichitta. He also spoke briefly about different levels of consciousness beginning with the consciousness of our normal waking state, the subtler dream state, the yet subtler consciousness of deep sleep and the subtlest consciousness that manifests at the time of death. His Holiness then resumed his reading of the complex discussions presented in the ‘Buddhapalitavrtti’, which in this section of Chapter 7 dealt with the arising, endurance and cessation of phenomena and what that implies about their existence. Tomorrow, he will continue his reading as well as bestowing an Avalokiteshvara permission.